Mauritius is divided into nine districts which consist of two cities, four towns and 130 villages. Each district has beautiful and unique places perfect for your wedding. Flacq Market is the country’s largest open air market and is in one of the most important villages in Mauritius. It is extremely colorful and attracts a large number of people. Ile aux Aigrettes is a tiny coral island, just off the coast of the town of Mahebourg, that has been declared a nature conservation site and is home to endangered species, including a few of the world’s rarest birds, and the Aldabra giant tortoise. Some of the plants found here grow nowhere else in the world. Mahebourg is one of the main fishing villages on the island and is situated on the magnificent Grand Port Bay. The Monday market is the main attraction of the city and one of the biggest and best on the island. Euroka Creole House is reputed to be one of the largest houses on the island, and built in 1830, was restored and opened to the public as a museum in 1986. It is a unique Creole house with a magnificent garden surrounded by waterfalls of the Moka River and the Moka Range. Mauritius Botanical Garden is one of the most popular tourist attractions and is the oldest botanical garden in the Southern Hemisphere. Built in 1767, it's most famous for its giant water lilies, spice garden and unique collection of 85 varieties of palms. Trou aux Cerfs is an extinct volcano located in Curepipe which is 300 meters in diameter and 85 meters deep. In the center of the crater there is a small lake. It stands at 605m offering a spectacular view of the major part of the island. 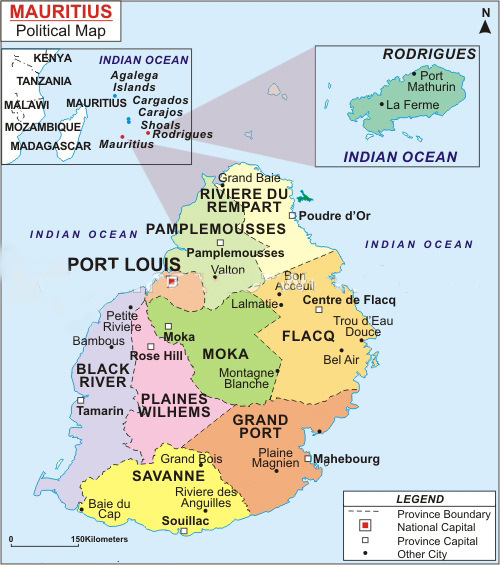 Port Louis is the capital city and main port. Surrounded by a mountain range called the Port Louis Moka Range, it is home to many French styled, historic and colonial buildings, the Caudan Waterfront, Port Louis Bazaar, Police Barracks, the Mauritian Chinatown, the old Port Louis theatre and three museums. Grand Baie is one of the highlights and is known for its restaurants, bars, clubs, catering and food shops. Chamarel park is the only place in world where you can find a clay earth of seven colors in one place. It is a geological curiosity and a major tourist attraction. The park also offers one of the islands five most famous waterfalls that cascades 100 meters down into the gorge. Black River Gorges National Park in the hilly south-western part of the island is home to over 300 species of flowering plants and nine species of bird unique to Mauritius, including the famous pink pigeon. Also in Savanne is Grand Bassin, also known as Ganga Talao, a lake which is situated deep in the heart of Mauritius in a secluded mountain area. Every year the Hindu community performs a pilgrimage here as it is believed that the water inside the lake communicates with the waters of the holy Ganges of India. A statue of Shiva, standing at 33 meters, overlooks the Ganga Talao. Find out more about getting married in Mauritius in our Mauritian Wedding Guide or browse our Mauritius Wedding Directory to start planning your dream wedding.